Keith Vaz motioned Parliament for PEGI to classify "ultra-violent" games differently. 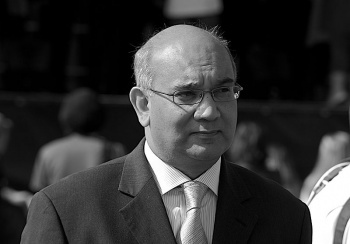 Across the pond, MP Keith Vaz from Leicester East has long been an opponent of violent games, from his calls against Rockstar's Manhunt and Bully to linking a racial serial killer to Counter-Strike. Now, he is using the recent testimony from the Norweigan shooter Anders Breivik to demand for stricter classification of games. "This House is reminded of the consequences of the ineffectual Pan European Game Information (PEGI) classification system for video games following the testimony of Anders Breivik about the tragic events in Norway in July 2011," reads Vaz's motion before Parliament. "Breivik describes how he trained for the attacks using the video game Call of Duty: Modern Warfare," Vaz continues before stating he "is disturbed that Breivik used the game to help hone his `target acquisition' and the suggestion that the simulation prepared him for the attacks." Vaz "is concerned that PEGI as a classification system can only provide an age-rating and not restrict ultra-violent content" and he "recognizes that in an era of ever-more sophisticated and realistic game-play more robust precautions must be taken before video games are published." He ends by calling "on the Government to provide for closer scrutiny of aggressive first-person shooter videogames." I find it depressing that someone with as much authority and responsibility as Keith Vaz has as a Member of Parliament finds it necessary to use every potentially scandalous story involving games as a way to further his own agenda. Vaz sees violence in games as a threat to public safety, but he refuses to look at the evidence on the matter and instead is influenced by infrequent events and testimony.